John Tighe has pleaded not guilty to murdering his son Joshua on 1 June 2013. THE PROSECUTION IN the trial of a father accused of murdering his baby son has highlighted what it says are inconsistencies in the accused man’s account of how the infant died. John Tighe (40) of Lavallyroe, Ballyhaunis, Co Mayo has pleaded not guilty to murdering six-and-a-half-month old Joshua Sussbier Tighe at his home on June 1, 2013. It is the prosecution case that baby Joshua choked on a wad consisting of two scrunched up pieces of tissue that was placed in his throat by the accused. Tighe has maintained from the outset that he was changing the baby’s nappy, went to the toilet and when he returned Joshua was choking on the tissue. 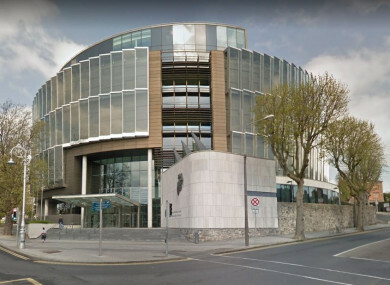 Prosecution counsel Paul Murray SC began his closing speech to the jury of nine women and three men by saying that this is a very sad case involving the death of a 6-and-a-half-month old baby, but they must be dispassionate and apply logic “with no emotion for one side or the other”. He told them that if they look at inconsistencies in Tighe’s accounts of what happened and tie that with the medical evidence, they will be satisfied beyond reasonable doubt that the accused is guilty of murdering his son. On the accused man’s account, he said, Joshua’s death was a simple, tragic accident and as such you would expect it to be consistent. However, Murray pointed to what he said are conflicting accounts as to whether he used tissue to apply Sudocrem to the baby, whether he could hear the baby making noise when the accused was in the bathroom and Joshua’s condition on his return from the bathroom. He further suggested that Tighe was inconsistent about whether he put the baby under the tap to moisten the tissue and when he first noticed blood coming from the child’s mouth. He asked the jury to look at photos of the house, which he said was “tidy and neat”, without even a tissue on the floor despite claims that Tighe was panicking, wiping blood from the child’s mouth and trying to save him from choking to death. The box of tissues was intact and Tighe even had the presence of mind, counsel said, to put all the used ones into the fire place because, as he told gardai, it was cheaper to burn them than to dispose of them in the bins. Further inconsistencies, Murray said, could be seen when he told emergency services that he had been tapping the baby’s back for ten minutes to try to clear the obstruction but in later accounts said nothing about tapping and said then that he put his fingers into the baby’s mouth to try to remove the obstruction before calling emergency services. During the call Murray said the accused told nurses that he could see the obstruction but in later statements to gardaí said he couldn’t see anything. Murray said that the first time the accused suggested the possibility that his efforts to retrieve the object could have pushed it further down came in June 2014, more than a year after Joshua’s death. A year after that Tighe told gardaí for the first time that, as he was trying to retrieve the obstruction, he heard a “crack” and the obstruction slipped down further. Murray described it as an “evolving account” from one time to the next. Counsel also asked the jury to consider the recording of the emergency phone call which was played to them during the trial. He said Tighe was emotional at times but at others calm and rational, able to give directions and at one point stating that the call is costing him credit and that he has another call coming in. The last inconsistency Murray suggested the jury look at was that Tighe said nothing about scrunching up the tissues in interviews he gave to gardai in 2014 but by July 2015 there was a “complete change”, with Tighe stating that when he used tissues he might scrunch them up and leave them. Murray pointed to medical evidence from two paediatricians who said that the baby could not have formed the wad or swallowed it to the point where it was found in the throat. Dr Hilary Stokes, he said, had told them the baby would reflexively gag and expel such a large object. Only one person, he suggested, could have put the wad there and that is the accused man. He further stated that it would be nonsense if anyone were to say that a person could do that without intending to cause serious harm or death. Mícheál P O’Higgins for the defence began his closing speech by telling the jury that the first thing that suggests Tighe’s innocence is the fact that he called emergency services for help to save his son. He said an intention to kill his “beloved son” is difficult to reconcile with that fact. He also asked them to look at the statements of Ann and Tom Shannon, Tighe’s neighbours. Counsel said those statements showed that the accused was highly regarded “a great lad” and “very obliging”. Tighe is not a criminal, O’Higgins said, but a person who loved his child and his father. There was no history of violence and the child’s mother, Natasha Sussbier, had no concerns about him looking after the child. He pointed out that following Joshua’s death they got back together and had a second child. Would she do that if she believed he had killed their first child? he asked. He also addressed what he said was the prosecution’s suggested motive – that Tighe was angry after seeing a Facebook message announcing Natasha had begun a new relationship. He said that “disintegrates like powder” when you consider that Tighe knew long before this point that she was in a relationship. O’Higgins said his client’s accounts of what happened were not clever attempts to give gardaí a “line” but a genuine attempt to give his best explanation for what happened. It was inevitable, he suggested, that his client’s accounts would differ. He described as unworthy and unreasonable any suggestion that Tighe was “faking it” or giving an “Oscar winning performance” when he broke down crying during the emergency call, in interviews with gardaí, and when talking to emergency personnel. Looking at the medical evidence, he pointed out that Dr Hilary Stokes had said the most common cause of accidental death among babies under one year old is by choking. He said paediatrician Dr Peter Keenan had said the child could have put a pre-balled wad into its mouth and swallowed it past the tongue. Although Dr Keenan said the wad was too big to have been swallowed to the point where it was found in the child’s throat, O’Higgins said the jury must consider the likelihood that his client’s efforts to remove the obstruction using his fingers could have pushed it down. He asked them to remember that the emergency call suggests that the situation went from one where the baby was alive and could be heard breathing with difficulty, to one where the baby was completely silent. He said it is more than a reasonable possibility that the wad moved during that call and that injuries to the child’s throat were caused by Tighe’s efforts to remove the obstruction with his fingers. O’Higgins will complete his closing speech to the jury in front of Justice Patrick McCarthy tomorrow. Email “Father accused of murdering infant son has inconsistencies in his account of death, court hears”. Feedback on “Father accused of murdering infant son has inconsistencies in his account of death, court hears”.